Eight-hundred years ago, the Ki-Rin Clan left Rokugan to scout the world for enemies beyond the Emerald Empire. When they returned, they cut a swathe through the Crab Clan’s defense and devastated the Lion. Though they have returned to the fold, reborn as the Unicorn, the Clan still struggles to integrate with the rest of the Emerald Empire. They are viewed as foreigners with strange ways, wandering nomads who fight in unnatural ways with their powerful Meishōdō magic and superior horsemanship skills. 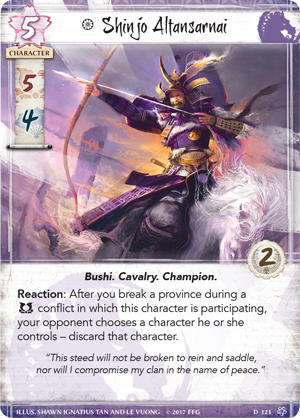 Today, we’re previewing the Unicorn Clan in Legend of the Five Rings: The Card Game, experts in confusing their foes with a bevy of combat tricks and military might. 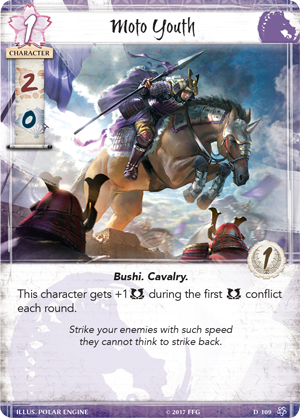 The Unicorn are one of the most mobile clans in Rokugan, experts at getting the drop on their opponent and striking before they even have an opportunity to act, providing them several advantages when they are the first player. 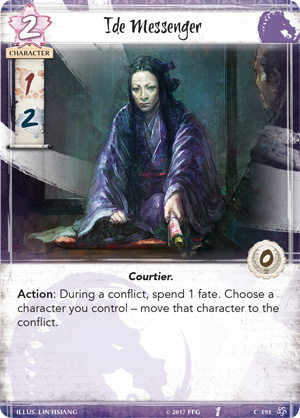 For example, the powerful Meishōdō Wielder (Core Set, 113) is a balanced character with a two military and two political skill at a cost of two fate. 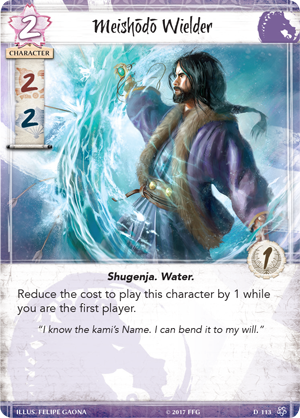 However, the cost to play the Meishōdō Wielder is reduced by one while you are the first player, making him one of the most cost-effective characters in the game. The Unicorn excel in military conflict, and no character emphasizes that more than the Moto Horde (Core Set, 119), a four-cost character with six military skill and a dash for political skill. The Horde have one mission, to overrun their opponents with sheer military might. Their purpose is so singular that they can’t have any attachment other than Weapons. While this may seem restrictive in your attachment options, it also applies to your opponent, so the Phoenix will not be able to pacify (Core Set, 174) the unrelenting Moto Horde. At a cheaper cost, the Moto Youth (Core Set, 109) excels in the early part of a turn. At one-cost and two military skill, the Youth is already well prepared for military conflicts, but they also receive an additional military skill during the first military conflict of the turn, meaning they are automatically raised to three military skill all for the cost of one fate. This makes the Moto Youth a high-value character that will be essential to the Unicorn’s plan of attack. 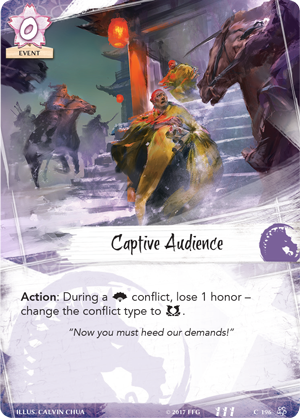 To shore up their political weaknesses, the Unicorn can bend conflicts to their will with Captive Audience (Core Set, 196), which allows you to change a political conflict to a military conflict at the cost of one honor. This can be used to completely quell an opponent’s political force, or to give you a second military conflict during a turn. The Unicorn have plenty of ways to manipulate conflicts, moving characters to and from battles with ease, sending reinforcements when it’s clear they can break a province. The Ide Messenger (Core Set, 191) is a conflict character that costs two fate and boasts one military and one political skill. The Messenger has the ability to move a character you control to a conflict for the cost of one fate. 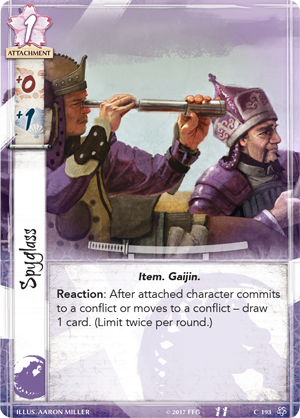 If that character has a Spyglass (Core Set, 193) attached to them, you may draw a card with its ability. If an Ide Trader (Core Set, 116) is in the conflict, you can use his ability to draw an additional card or to gain a fate when he meets his reinforcements. 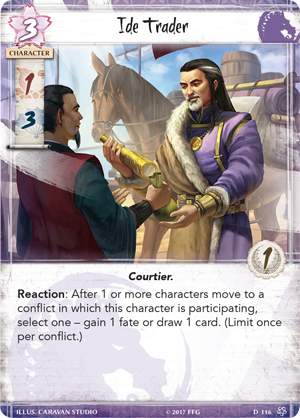 All three of these cards combine exceptionally together well and give a political and resource boost to the Unicorn that can be essential to winning these integral conflicts. 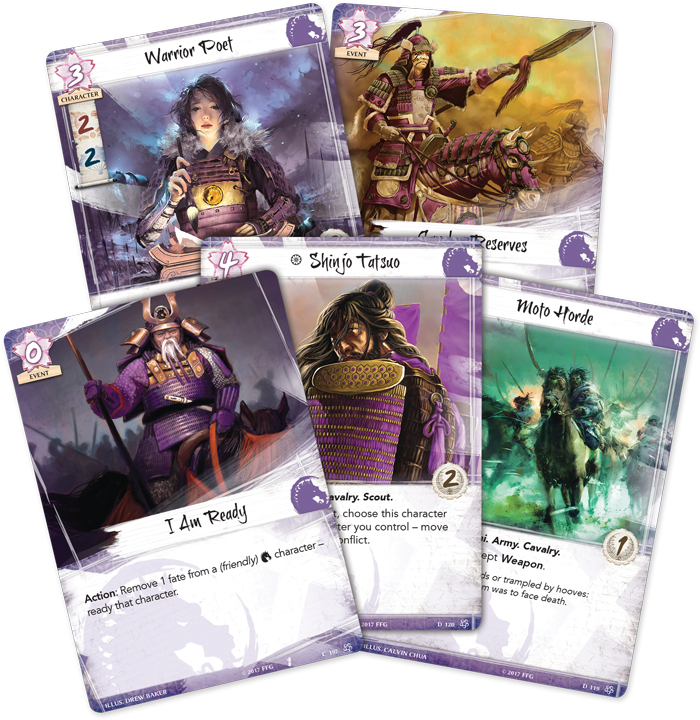 Unicorn characters can also enter conflicts through the ability of Shinjo Tatsuo (Core Set, 120), a four-cost dynasty character with three military and three political skill. You can choose to move Tatsuo and up to one other character you control to the conflict. This can provide a massive swing of skill to any conflict, especially with the balanced skills of Shinjo Tatsuo. It’s not just characters that can be moved either; Giver of Gifts (Core Set, 115) allows you to choose an attachment you control and move it to an eligible character you control. This can help you move attachments from a character with no fate to a character that will be around in upcoming turns, extending the amount of time the attachment is on the field. Attaching a Favored Mount (Core Set, 192) to a character not only gives them an additional military skill, but the mount can be bowed to move the character to a conflict. 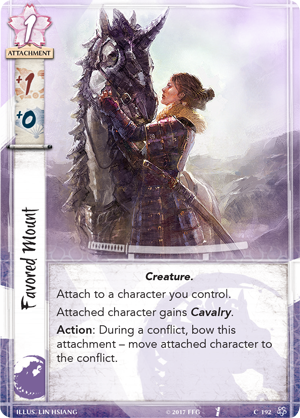 It also provides the attached character with the Cavalry trait, allowing them to be targeted by several Unicorn cards. 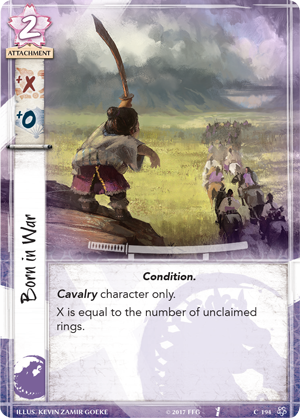 Born in War (Core Set, 194) attaches to a Cavalry character and gives them an additional military skill for every unclaimed ring. This can give the character a massive boost in early conflicts, but gives diminishing returns as the conflict phase continues. All this means is what the Unicorn wish to do anyway—declare military conflicts early to get the most out of Born in War. 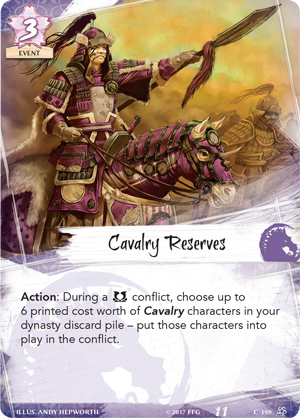 One of the most effective tools the Unicorn have is Cavalry Reserves (Core Set, 199), a three-cost event that allows a player to choose up to six printed cost worth of Cavalry characters in their dynasty discard pile and put them into a military conflict. This can provide a huge amount of force your opponent is not expecting, repel a large force, or provide the boost you need to break a province. Other clans must always be vigilant when it comes to the Unicorn and their cavalry. Their Stronghold, the Golden Plains Outpost (Core Set, 7) can be bowed to move a Cavalry character they control to a military conflict. 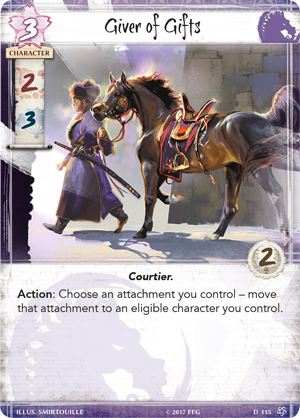 Though it adds no province strength to your stronghold province, the ability to move a Cavalry character to a military conflict will constantly keep your opponent on their toes, and give you the flexibility needed to overrun your foes. 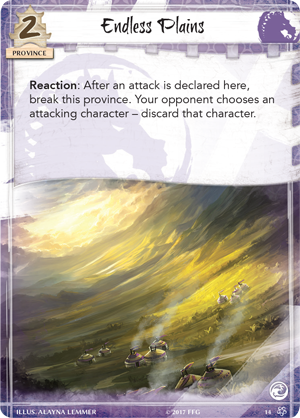 The Unicorn Province Endless Plains (Core Set, 14), only has two strength, but can be broken as a reaction to force your opponent to discard an attacking character. When used at the right time, this can provide a massive momentum swing and can often be worth breaking your own province. 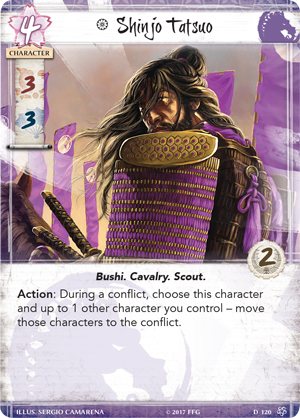 As the Unicorn Clan continue to reintegrate into Rokugani society, their Clan Champion Shinjo Altansarnai (Core Set, 121) cuts her own path through the Emerald Empire. 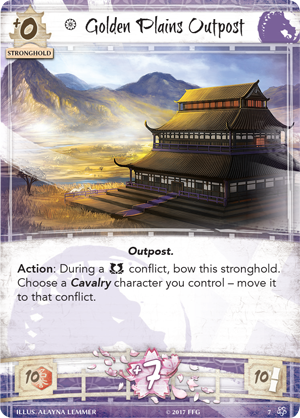 Altansarnai enters Legend of the Five Rings: The Card Game with five military and four political skill and two glory and may be one of the most aggressive characters in the game; after you break a province during a military conflict in which Altansarnai is participating, your opponent must discard one of their characters from play. The earlier you can trigger this ability, the bigger effect it will have on your opponent as they are forced to discard their characters, potentially before they’ve even had an opportunity to participate in a conflict. 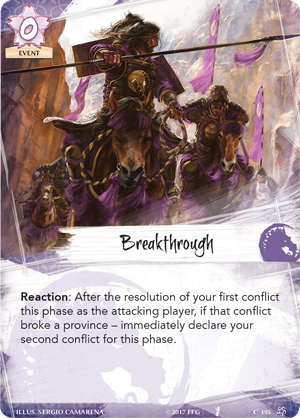 The Way of the Unicorn (Core Set, 198) can ensure Altansarnai gets to use her ability early in the conflict phase, and Breakthrough (Core Set, 195) can take advantage of your opponent’s momentum loss and keep the Unicorn on the offensive. 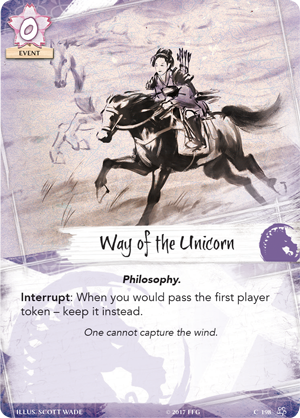 With unrelenting speed, the Unicorn, led by Shinjo Altansarnai, can destroy their enemies before they even have a chance to counter-attack. 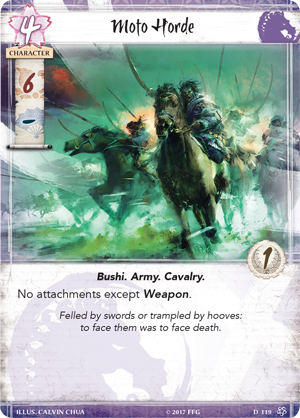 With vicious military might, strange ways, and the best Cavalry in Rokugan, the Unicorn are an aggressive Clan unafraid of those who would challenge them. 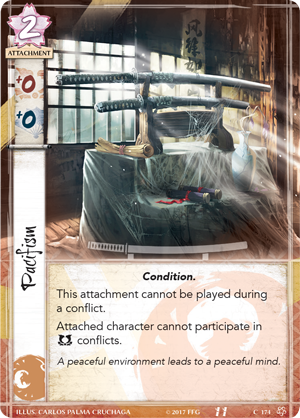 Join us early next week as we explore the final unrevealed Clan of Rokugan: The Scorpion. 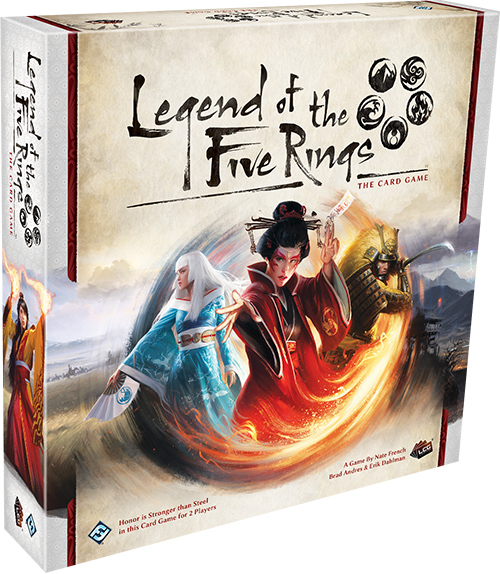 Mount your steed and purchase Legend of the Five Rings: The Card Game (L5C01) at Gen Con 2017 or from your local retailer in the fourth quarter of 2017.